Actually, I am still experimenting the usage of green tea powder because some of the time it turns out in such fantastic colour and some other time it is not ! I wonder if it is related to the branding or the mixing method. I will start investigating as soon as I found some other branding of green tea. The latest batch of green tea colour turns out to be really dull compare to the tea powder I bought 2 years ago, as shown the above picture. 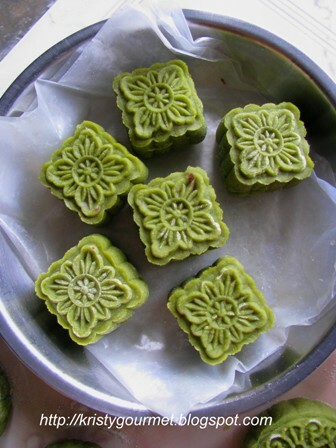 And these mooncakes were made by the latest batch of green tea powder. Absolutely, dull & isn't attractive at all ! (1) mix together koh fun, cocoa powder & dark cocoa powder into a big bowl till well combined. (2) rub in shortening till everything became fine crumb. (3) stir in syrup water & ice water till soft dough is foamed. Then set aside to rest for 30 minutes before used. 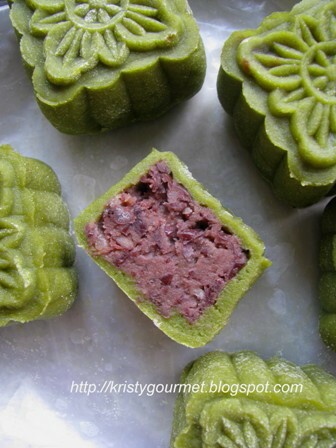 For large mooncake, divide green tea dough into 63-65gm each and red bean paste into 90gm each then round it. Now, wrap bean paste with green tea dough and nicely sealed. Then coat it with koh fun then mould it with mooncake moulds. Best to keep refrigerated before serving. 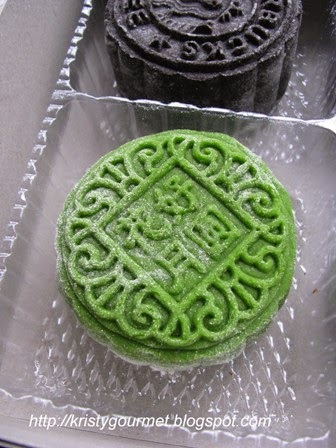 For small mooncake, divide snow skin dough into 20gm each and red bean paste into 30gm each. 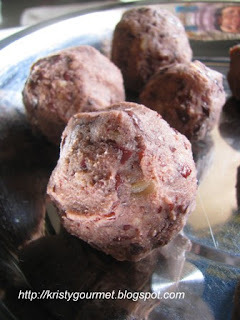 However, the combination made out of this chunky red beans paste with red dates & longan is really refreshing. Hope you guys will love it too. Happy weekend ! Can I have one? Just one and I am a happy gal :-)) They look perfect, Kristy. Can I substitute shortening with cooking oil of the same amount? Thanks for stopping by my humble little space. To your question, No, you can't substitute shortening with cooking oil on this recipe. However, you may try with margarine. By adding in one tablespoon at a time, if possible reduce the amount of margarine. Personally I would prefer the latest batch of Green tea, the colour is more natural akin to Green tea. The previous one looks like green colouring has been added.